As kids enter middle school, they may experience ups and downs. 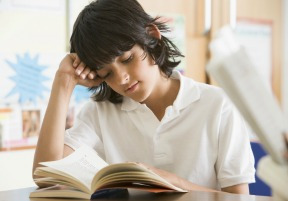 Here are five chapter book series to help kids adjust and enjoy the middle school experience. And have a few more laughs along the way. This story, the first installment of a new series by James Patterson and Chris Grabenstein, follows a twelve-year-old girl named Jacky, the class clown who loves more than anything to make everyone around her laugh. But it doesn’t matter how much Jacky makes everyone laugh; she still has her own doubts and worries. Can she continue to please others with her jokes while also taking care of herself? From the publisher: “James Patterson introduces his hilarious new heroine, Jacky Ha-Ha, a class clown who makes people laugh with her so they can't laugh at her. The stories of the Wayside School are nothing short of wacky. The school was built with the classrooms on top of one another instead of side-by-side. There are funny teachers, and the craziest of things, like some of the children being turned into apples and young girls trying to sell their toes, happening in the classrooms. Is this really what middle school is like? This series of three books follows a boy named Kevin. In the first, Liar, Liar, Kevin is talented at convincing people of something other than the truth, even though he doesn’t mean to cause trouble with his lies. In Flat Broke, Kevin is all out of cash, and tries to find a way to make money, which shows a more driven, mature side of Kevin. And in Paulsen’s Crush Kevin tries his hardest to impress his crush, Tina Zabinski, the “Most Beautiful Girl in the World.” Kevin goes through the typical middle school rounds, and may help your niece or nephew through their time at school. Jenny McAfee is a pre-teen girl doing her very best to make her way through middle school. Jenny tackles what middle school has to offer – new friends, classes, popular groups of kids, first crushes, and school spirit. This series offers help for a multitude of things to tackle: travel; holidays; and life in general, but the one you and your niece or nephew would want is the Middle School book. It gives quick tips for young kids making their way through a new school environment, such as a crazy homework schedule, awkward moments, and heartbreak.